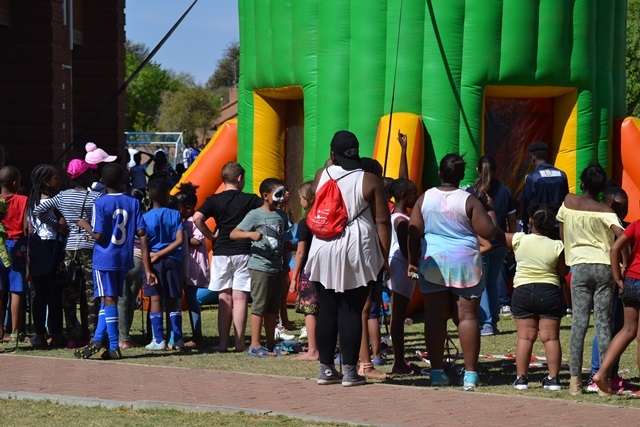 “Each year students and residents of Mafikeng and surrounding areas eagerly await the International School of South Africa Fun Day so that they can spend an enjoyable afternoon of fun and excitement with their families playing a range of games, face painting and soccer. Families from different backgrounds descend upon on grounds in the spirit of having fun. This year the entertainment and food were no different to last year; all ages were accommodated with marimbas, karaoke, hungry hippo, target shooting tea garden, cappuccino and doughnuts to curry and rice; just to mention a few. The highlight of the afternoon was the soccer matches. The teams were split up into groups and each group had a winner and a runner-up. Notable teams that took part were the ABC (African Ball Controllers) and one of our International School of South Africa’s junior teams, Y Dollar Sign. To top the day we had music playing throughout the Fun Day which created an ebullient mood and vibe. It was really a day of dancing and playing funny games. Fun Day is a great way for the teachers, students, families and residents in the Mafikeng area to get to know each other better and share some memorable moments.